Every Bible class teacher has probably learned to sketch the coastline of Canaan (Palestine, Israel). Be sure to make that little jut out into the Mediterranean Sea to represent Mount Carmel. But Mount Carmel is much more; it is a range. Consisting largely of limestone, the mountain is almost 15 miles long by 5 miles wide. The elevation is about 1500 feet above sea level. From the western promontory one can overlook the city and port of Haifa. The Roman general Vespasian, who later became emperor, offered sacrifices on Mount Carmel before the war against the Jews (A.D. 66-70) (Hoade, Guide to the Holy Land, 665). The location of Mount Carmel made it practical for travelers going north or south to travel around the mountain through the Jezreel Valley (or Valley of Megiddo). To the Greeks it was the Valley of Esdraelon. Carmel is best known as the place of the contest between Elijah and the prophets of Baal. Elijah had king Ahab to call all Israel and the 450 prophets of Baal to Mount Carmel (1 Kings 18:17-40). 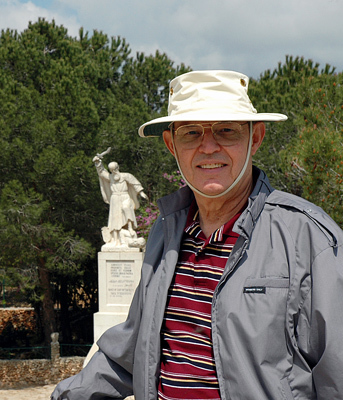 The traditional site for this event is shown at Muhrakah on the eastern end of Mount Carmel. Below the Carmelite monastery of St. Elijah can be seen the valley of Megiddo and the tell of Jokneam (Josh. 12:22). The brook Kishon, where the prophets of Baal were slain, is nearby (1 Kings 18:40). 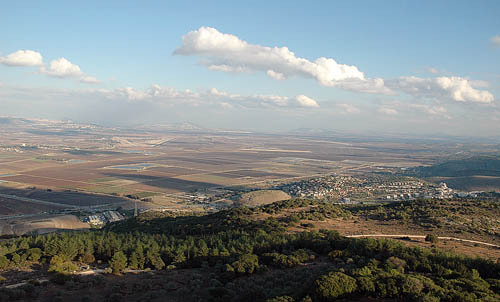 The photo below of the Jezreel Valley was made from the roof of the monastery. The view is a little to the north, but mostly to the east. The tell in the center of the photo immediately below the mountain is Jokneam. The Bible mentions its “pasture lands” in Joshua 21:34. In the distant left you can see the mountains of lower Galilee, where Nazareth is located. Mediddo, not visible, is to the extreme right. The River Kishon is just a little to the left of this view. The Valley of Megiddo was the scene of many significant historical battles and provides the background for the setting of Armageddon (or Har-Magedon) in Revelation 16. The photo below is intended to remind travelers to wear a hat and sunscreen when visiting Israel. It is much brighter than most Americans are accustomed to in the spring of the year. Dr. Jack P. Lewis was honored March 6 at a dinner hosted by Faulkner University, Montgomery, Alabama, during their annual Bible lectureship. 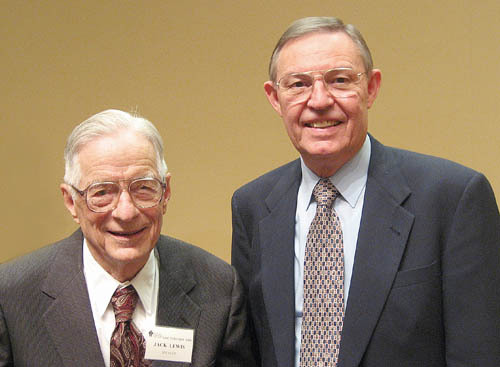 I was pleased that I could attend the lectures one day and be present for the dinner honoring Dr. Lewis. Lewis is Professor Emeritus at the Harding Graduate School of Religion in Memphis. Among several good teachers that I had, Lewis was unique. He holds two earned doctorates, a Ph.D. in New Testament from Harvard, and a Ph.D. in Old Testament from Hebrew Union. He was the most demanding teacher I had, and one of a few from whom I learned the most. After the high school years at Athens Bible School, and four years of Bible at Florida Christian College (now Florida College), with teachers such as Homer Hailey, I had a good general knowledge of the Bible. I think I had about 60 hours of Bible at FCC. The graduate work was not too difficult, it was just on a higher level. In one of the classes with Dr. Lewis I did a paper on “Authentic First Century Remains in Palestine.” Soon afterward I began to prepare for my own visit to the Bible lands. I might have gone anyway, but I must credit Dr. Lewis, and his unique insight into the land of the Bible, for spurring my interest in traveling to this part of the world. The other day, as we visited, he said something like this: “There is nothing as valuable as seeing the places you study about.” So, now you know one of the major motivations in my travels to Bible lands over all these years since the first trip in 1967. I still learn on every trip, and in the preparation for the trip. Dr. Lewis is a prolific writer. His many books included The History of the English Bible from the KJV to the NIV, The Interpretation of Noah and the Flood in Jewish and Christian Literature, Historical Backgrounds to Bible People, a two volume commentary on the Gospel of Matthew. There are also books on the prophets and other areas of biblical studies. Several Faulkner faculty members spoke of what Lewis had meant to them. These included Dr. Cecil May, Jr., Dr. Carl Cheatham, and Dr. Ed Hicks. Dr. Jim Howard, from Memphis, was also on the program. Carl and Jim were at HGSR when I was there. Cecil and I spoke on the same topic at both the Nashville and Dallas meetings of institutional and non-institutional brethren a few years back. It was a pleasure to see them. In the afternoon, Dr. Lewis had presented a lecture on “The Battle for the Integrity of the Bible.” In his typical rapid-fire manner, he surveyed the battles that have been won in demonstrating the integrity of the Bible. It was just a survey, but he seemed as sharp as in those classes on The History of the English Bible and on Archaeology and the Bible from which I profited so much. Today Dr. Jack Pearl Lewis is 89 years old. Happy birthday, Dr. Lewis. Abel Meholah (or Abel-meholah), NAS, ESV is a tell in the Jordan Valley, about 10 miles south of Beth-shean. It is mentioned only three times in the Bible. The Midianites, who were fleeing from Gideon’s army of 300, fled as far as the border of Abel Meholah (Judges 7:22). Solomon (reigned 970-931 B.C.) set up administrative officers over Israel. Baana, the son of Ahilud, was over the fifth district that included Abel Meholah. Baana the son of Ahilud, in Taanach, Megiddo, and all Beth-shean that is beside Zarethan below Jezreel, and from Beth-shean to Abel-meholah, as far as the other side of Jokmeam (1 Kings 4:12, ESV). Many of us likely would find Abel Meholah of interest as the home of Elisha the prophet. When Elijah met the LORD at Horeb, the mountain of God, he was told to do three things: (1) Anoint Hazael king over Aram [Syria]; (2) Anoint Jehu king over Israel; (3) Anoint Elisha from Abel Meholah to take his place as prophet. This took place around the middle of the 9th century B.C. See 1 Kings 19:11-16. Elijah and Elisha were two of the more important oral prophets of Israel. 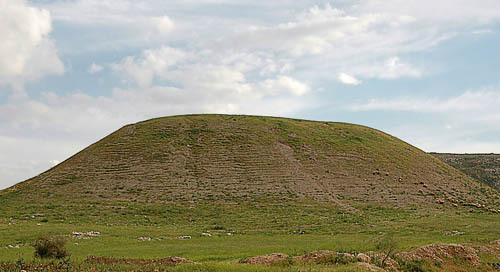 Elijah was among the settlers of Gilead, on the east side of the Jordan (1 Kings 17:1). The identification of Abel Meholah is uncertain. Two sites east of the Jordan River have been suggested. The biblical statements seem to favor a site on the west side of the Jordan. Four sites have been suggested. Check the Anchor Bible Dictionary for details and a bibliography. Our photo is of Tell Abu Sus. Future excavations may help settle this question. This is a beautiful example of a tell. Who knows what might be buried within it? USA Today has an article about “Inspirational religious tours” about the variety of tours available to people who wish to follow the steps of this or that religious person. Here are some comments about Israel and Jordan that you might find interesting. Lately, that perception hasn’t slowed visitation to Israel and Jordan—both countries had record numbers of visitors last year. Israel hosted more than half a million Americans in 2007, an all-time high, (according to the country’s tourism commissioner), and Jordan’s Tourism Board said the country’s tourism revenues increased by more than 13% in 2007. Is they have for millennia, the world’s holy sites continue to exert a powerful draw over the faithful and the curious. These days, with modern transportation and updated standards of travel, it’s getting easier to walk in the footsteps of the holy ones, with much less of that ancient travail. 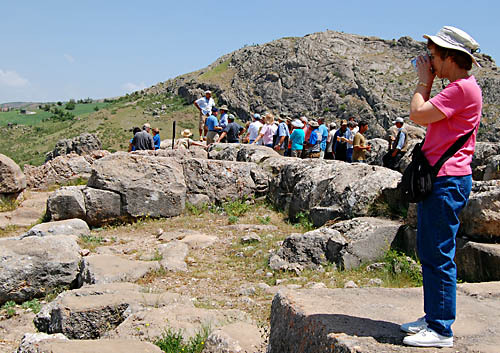 The tours I direct are study tours, but almost everyone who travels with us finds the tour inspirational. Most of those who travel with us do so in an effort to increase their understanding of the Bible. 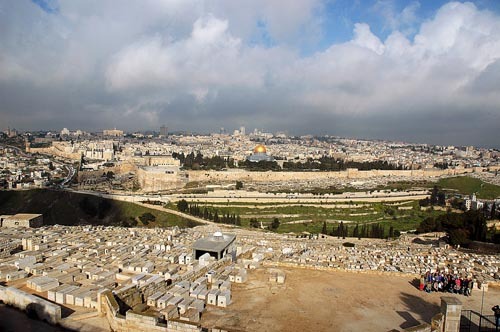 This view of Jerusalem from the Mount of Olives is inspirational to a lot of people. I just ran across the third edition of A Day in Capernum by Franz Delitzsch. Yes, the Delitzsch of the famous Keil and Delitzsch 19th century commentaries on the Old Testament. The book was written in 1870, but the third edition was published in 1892. In the days before motorized vehicles, visitors had to travel by foot or horseback. This had a distinct value in allowing more time to meditate and understand the importance of the travel routes, etc. The writer visits some of the other places around the Sea of Galilee and tells how long it took to move from one place to another. Works of this kind are of value because they reflect the scholarship and understanding of the time. You may read the work online, or download it in PDF from Google Book Search. Here is the directly link to A Day in Capernaum. Google Book Search is a wonderful place to find many older works in their entirety. Some pages of many newer works are also availalbe. Things have changed a lot at Capernaum since Delitzsch was there. We believe the foundation of the synagogue from the time of Jesus is known. The synagogue from the late 4th or early 5th century A.D. has been partially reconstructed mainly by the late archaeologist Stanislao Loffreda. The photo shows how it looks today. 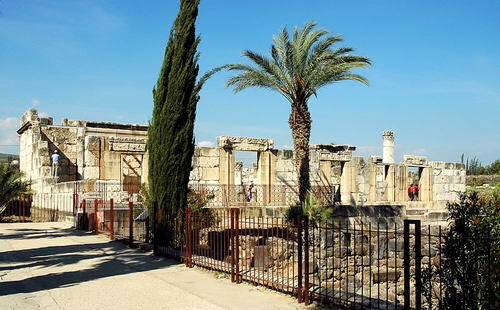 The most important thing about Capernaum is that Jesus came and settled in the city and that it was the scene of much of His ministry and miracles (Matthew 4:13; 11:23). There is some discussion over at the Tel es-Safi/Gath site about the correct identification of the photo from 1969 which I identified as Gath here. Based on my recollection of the location of the tel, I think those who have identified it as Tel Erani are correct. Here is a comment I have left on the Tel es-Safi/Gath page. Sorry to be the center of a controversy. I think this photo was made very near Qiryat Gat. I have only been in this area a few times and was having a hard time identifying this tel with the photos of Tell es-Safi. Todd is probably correct in saying this was still the identification given by a guide back in 1969. I am away from home for a couple of days but what I have been able to locate on the Internet indicates that the photo is of Tel Erani. My recollection is that this tel is on the north side of the road leading from Bet Guvrin and Lachish to Ashkelon. My plans are to be back in Israel in a month, but I won’t have the opportunity to check these places. Maybe later in the year!